Elliot crater recognises James Elliot (1943-2011), an MIT researcher who pioneered the use of stellar occultations to study the Solar System — leading to discoveries such as the rings of Uranus and the first detection of Pluto's thin atmosphere. The Johns Hopkins University Applied Physics Laboratory, Laurel, Maryland, manages the New Horizons mission for NASA's Science Mission Directorate. Alan Stern of SwRI is the principal investigator and leads the mission; SwRI also leads the science team, payload operations, and encounter science planning. New Horizons is part of the New Frontiers Program managed by NASA's Marshall Space Flight Center in Huntsville, Alabama. The New Horizons spacecraft — built and operated at APL with a payload and science investigation led by SwRI — performed the closest flyby of Pluto. 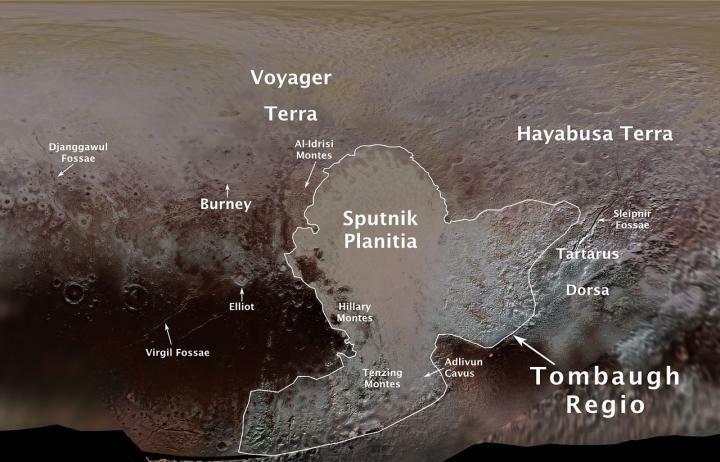 During the encounter, New Horizons collected more than 1200 images of Pluto and tens of gigabits of data.